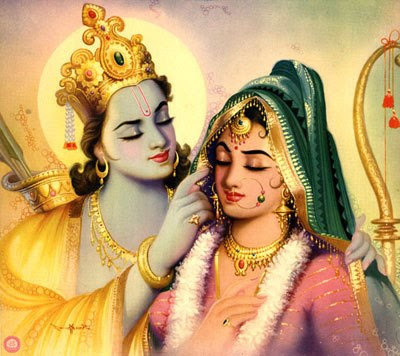 As said in SrI rAmAyaNam ayOdhyA kANdam 31.25 lakshmaNa says “bhavAmsthu saha vaidhEhyA girisAnuushu ramsyathE” (While you enjoy with sIthA in the foothills of the mountain, I will serve you both in all ways), ALavandhAr desires to enjoy emperumAn giving pleasure to pirAtti in different aspects. emperumAn who gives periya pirAtti joy by his sports/activities which are beautiful and skilful, which are making her feel brahmA’s life span being spent like a very small moment , etc.,, with many relishable aspects which are fresh (every moment), and who is having huge arms (which are suitable to embrace periya pirAtt). apUrva – Every moment, it feels different from what was observed in the previous moment. nAnArasa bhAva nirbhara – crowded with many different types of relishable aspects and the mood of interaction. prabudhdhayA – together. rasam – As said in “yEna mAdhyathi” (what makes one mad), when chEthana (sentient entity) thinks about that which makes them go mad [about it]. This is due to the bhAvam – emotional feeling of the fully expanded mind. kshaNANuvath kshiptha parAdhikAlayA – The parakAlam (life span of brahmA) which went by within a moment. parakAlam – life span of brahmA; parArdha kAlam – half of that time. mahishIm praharshayantham – emperumAn who gives great pleasure to pirAtti who cannot sustain herself in separation from him as said in SrI rAmAyaNam ayOdhyA kANdam 30.18 “yas thvayA saha sa svargO narakO yas thvayA vinA |” (sIthA – Oh rAghava! being together with you is heaven and being in separation from you is hell), SrI rAmAyaNam ayOdhyA kANdam 29.5 “thvath viyOgEna mE rAma! thyakthavyamiha jIvitham” (If I get separated from you, I should die immediately), SrI rAmAyaNam sundhara kANdam 25.17 “sarvadhA thEna hInAyA rAmENa vidhithAthmanA | thIkshNam vishamivAvAdhya dhurlabham mama jIvitham ||” (After being separated from SrI rAma who knows my heart, sustaining myself is very difficult like consuming poison), thiruvAimozhi 6.10.10 “agalagillEn iRaiyum” (SrI mahAlakshmi – I cannot leave emperumAn even for a moment). Since “praharshayantham” (extreme joy) is used, it is understood that this is eternal. mahA bhujam – Not only he gives pleasure through his relishable activities; but he would bring her joy by embracing her as said in thiruvAimozhi 4.8.2 “aNimAnath thadavaraith thOLAlE” (with the decorated huge mountain-like shoulders). Ofcourse, more than the qualities of svarUpam (true nature), the qualities of rUpa (form) are more enjoyable. This entry was posted in Other, sthOthra rathnam on February 2, 2017 by Sarathy Thothathri.